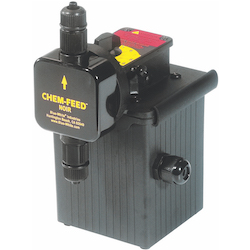 The Chem-Feed C-1500N diaphragm metering pump is compact, efficient and economically priced. Its features include an all-ball-bearing, permanently lubricated gear motor for smooth and quiet performance. This pump is offered with standard or deluxe output control options. Each standard unit has a quick-adjusting, accurate mechanical stroke length controls. The efficient design allows for a minimum stroke length of 5%. Deluxe units have both stroke length and electronic time interval controls.